It’s The Italian Job on water. 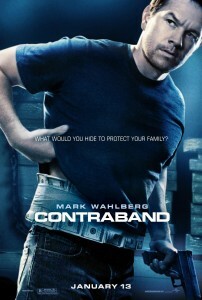 Take the plot, some of the actors, and action from that earlier Wahlberg film, replace the Mini Coopers with large cargo ships, and what you get is Contraband. While I’m giving the film a big fat ZERO for originality, as I’ve alluded to in similar instances in the past (see The Town), the film can still be entertaining. With Marky Mark, you know what you’re going to get. And while Wahlberg, along with Matthew McCounaghey) are probably the actors I rail on the most (I know you can’t sense any jealousy at all there…none), it’s not always a bad thing to know what to expect. He can handle action and is quite believable as a criminal. Shocking, right? The fact that Giovanni Ribisi plays alongside him only elevates his game. I’m not sure if it’s only because I watched the film on a flight to Italy, but I do think Ribisi is one of the best scene-stealing actos out there today. Since you know what you’re going to get and still manage to be entertained, I’d suggest you bump Contraband up on your Netflix list. My husband kept bugging me to rent this movie so I finally did on Blockbuster @Home. We even got it in Blu-ray and the action scenes looked great. I think Mark did a great job in this movie; I was definitely rooting for him. I wanted his brother-in-law to get killed; he was just getting them in more trouble. In the end, the movie had a good ending and I would recommend this to my friends, family and even my Dish co-workers. Blu-Ray is definitely the way to go with this flick!